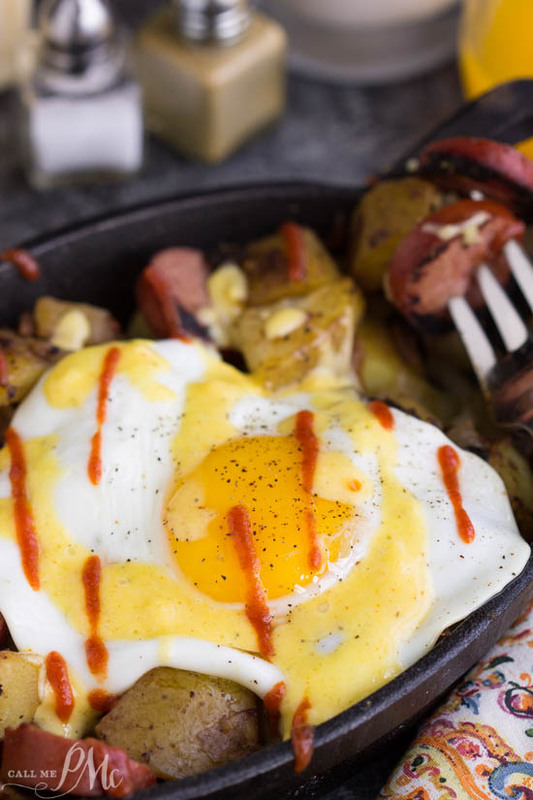 A delicious twist on Eggs Benedict, Sausage Potato Hash Fried Eggs Benedict Recipe has perfect fried eggs over sausage potato hash then topped with an amazing, creamy blender hollandaise sauce. Big Daddy loves Eggs Benedict and orders it everytime we eat breakfast out. After researching different versions of Eggs Benedict I created this post 25+ Alternative Eggs Benedict Recipes. However, I still wanted to make my own version. 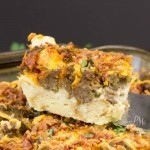 My husband introduced me to Sausage Potato Hash. It’s an economical and quick dinner when you’re in a tight. Using this recipe as a base for a Southern-style eggs benedict seemed logical. The egg had to be fried in my Southern version. Hollandaise is a must and I made a classic version in the blender. Then, I drizzled over just a hint of Sriracha for a little heat. 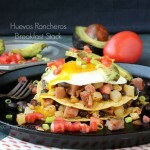 Sausage Potato Hash Fried Eggs Benedict Recipe is out-of-this-world good! I have to admit, I, personally, had never enjoyed any type of Eggs Benedict. I have had growing out of a ‘runny’ egg aversion. I know eggs top everything now, but I had not previously given in to it. But, wow, just wow!!! 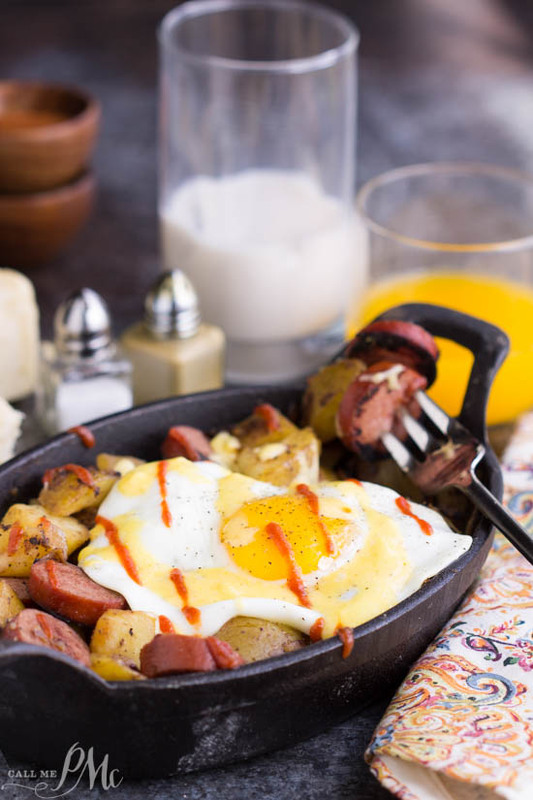 This combination of textures and flavors… the runny yoke, the creamy Hollandiase, the hearty sausage, soft and salty potatoes, then that kick of Sriracha at the end… I mean, I could not stop eating it. 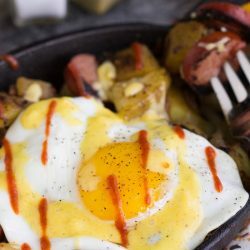 I made the Sausage and Potatoes exactly as in this recipe and used it as the base for this Eggs Benedict breakfast. You can poach your eggs if you prefer. I like to use Yukon Gold potatoes. They have a thin skin and don’t have to be peeled. Red potatoes are also good in this recipe, however, you will need to peel them first. Get the printable recipe for Blender Hollandaise Sauce here. As well, to kick up your Hollandaise sauce, you can add a pinch of cayenne. For creamy Hollandaise, add a tablespoon of sour cream, a sprinkle of Taco Seasoning, and fresh cilantro. Two to three tablespoons of Chipotle Sauce blended into Hollandaise makes a lovely addition. Also, add half of an avocado for Avocado Hollandaise. Finally, 1 tablespoon each of fresh parsley, fresh chives, and fresh tarragon makes a wonderfully fresh Hollandaise. this recipe is a delicious twist on Eggs Benedict. 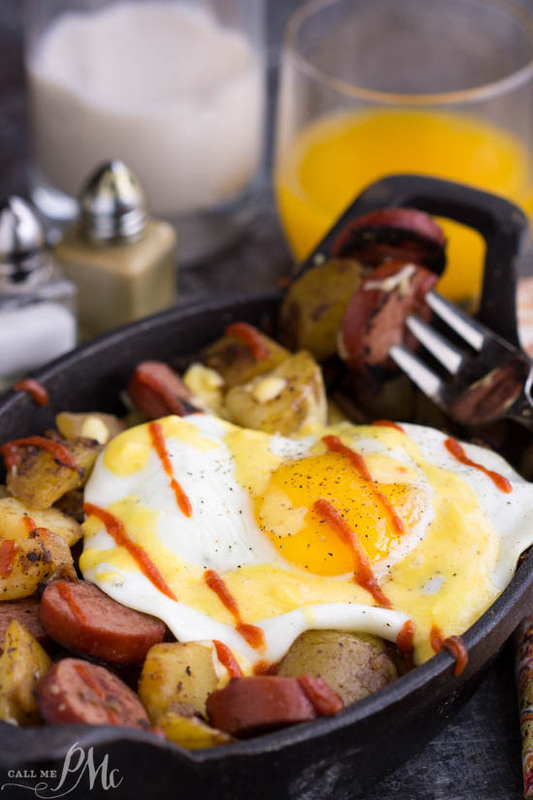 Sausage Potato Hash Fried Eggs Benedict Recipe has perfect eggs over sausage potato hash and topped with a blender hollandaise. For tips and substitutions please read post above. Wash and cube potatoes. Soak in water 30 minutes to an hour. Remove from water and drain potatoes. Add potatoes to a large pot. Add enough water to cover the potatoes. Bring to a boil, then reduce heat to medium and cook for 10 minutes. Drain potatoes well. 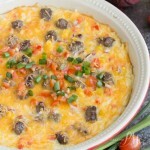 You do not want much water on the potatoes when you add them to the hot skillet! Fill a blender with hot water; set aside. Melt butter in a small saucepan over medium heat until foaming. Remove pan from heat. Put egg yolks and 2 tablespoons lemon juice in blender; cover and blend to combine. Working quickly and with blender running, remove lid insert and slowly pour hot butter into blender in a thin stream of droplets. Discarding the milk solids in the bottom of the saucepan. Blend until creamy sauce forms. Season to taste with salt and pepper, and with more lemon juice. Heat 2 teaspoons butter or oil in a skillet over medium-high heat until hot. Break eggs into a cup and carefully slide them into your pan, 1 at a time. Slowly cook until the whites are completely set and yolks begin to thicken but are not hard. Place a heaping spoonful of sausage and potatoes on serving the dish. Place fried egg(s) on top. Spoon desired amount of Hollandaise sauce on top of everything. Drizzle Sriracha sauce over everything, if desired.